Kids love their chucks and look really cool wearing them. 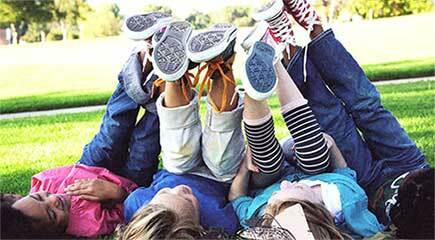 Looking to purchase a new pair of chucks in youth, todler or infant sizes? We recommend that you purchase Converse® All Star® Chuck Taylor shoes from one of our authorized Converse dealers. Go directly to their order pages by clicking on the shoe images outlined in blue below. You will find out immediately what sizes are currently available and ordering online is quick and easy. Little kids wearing high and low top chucks. View a photo gallery of Little Kids Wearing Chucks. After clicking on the Kicks USA link below, choose Kids Converse in the Search box. After clicking on the Kicks USA link above, choose Kids Converse in the Search box.